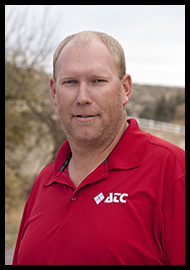 Erik Bywater, ATC’s “Immaculate Installer”, has been part of our ATC team since 2004. Erik began working in our Arco service area, and brought professional installation techniques, and a Cable TV knowledge base, to the table. In 2012, Erik relocated to our Albion service area, where he is still a customer favorite with his gregarious personality and award-winning customer service. Erik’s love of people and sporting activities is blissfully apparent, as he spends his free time fielding softballs from left field, racking up strikes in the bowling alley, and chasing his children. He loves Mountain Dew, Dutch oven cooking, and eating the chocolate off his Reese’s before he starts in on the peanut butter. We’re proud to have this outgoing, reliable technician on our ATC team!